**The Wisconsin Kiters Club will not be flying kites because of the low temperatures expected. **”Snow”ga has been moved from outside at the Village Park to inside at SOEL on Rhine Street. There will be no cost for the yoga class. 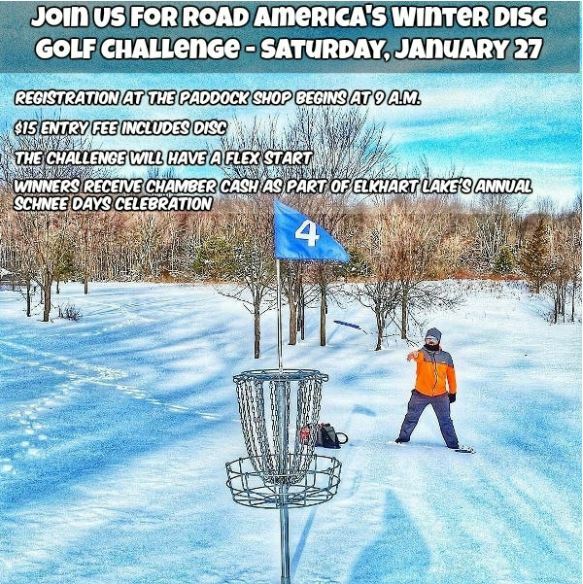 Join Us For The Disc Golf Challenge at Road America! Pub Crawl Map – Check it out! Be sure to join the Pub Crawl as part of our annual Schnee Days activities. Here is a map of the route! Cheers! 2018 Schnee Days is here! The 2018 Elkhart Lake Schnee Days Event is all set for the weekend of Thursday, January 25, 2018 – Sunday, January 28, 2018 here in Elkhart Lake! See the attached poster detailing out all the activities happening during this popular event – some all time favorite activities like the Schnee Lauf Run, Pub Crawl, etc., as well as a new activity – Disc Golf at Road America! Check it out. Don’t miss it! The kids activities have been moved from the Village Park to the Victorian Village front lawn. Snowshoeing at Quit Qui Oc Golf Club is cancelled. Save the date! Be sure to join us the weekend of January 26 – 28 for our 2018 Schnee Days event, right here in Elkhart Lake! More information to come. Check back soon for all the event details!